Halloween bingo cards are a great game that children can play at school, Halloween parties, or just at home with their siblings or friends. 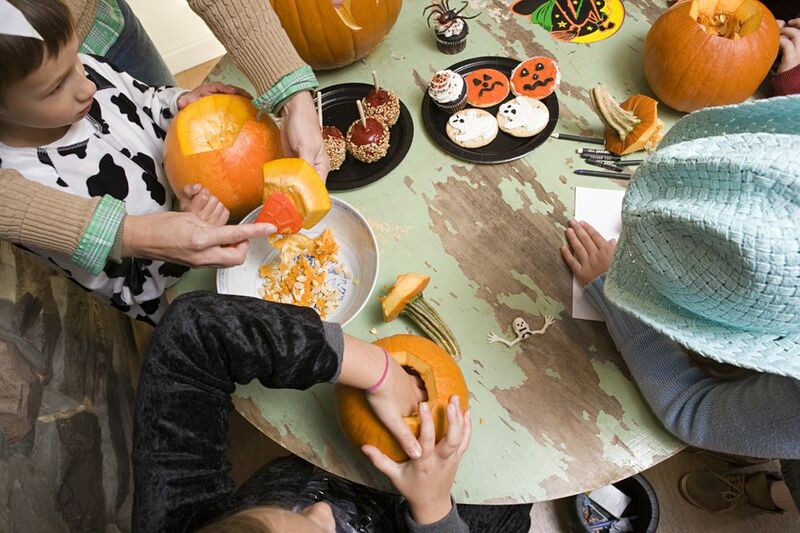 Besides being fun, Halloween bingo is a great game for teaching listening skills. It's even easy enough that even young children can play. The Halloween bingo cards you'll find below are all free and can easily be printed from your home or work printer. There are several different designs of Halloween bingo cards, so you'll be sure to find one you like. If your children like these printable Halloween bingo cards then they might also like some Halloween worksheets, Halloween printables, Halloween activities for kids, Halloween party games for kids, and Halloween freebies for the whole family. Growing Up Gabel has created this wonderful black and orange Halloween bingo cards that would work for kids, adults, and everyone in between. 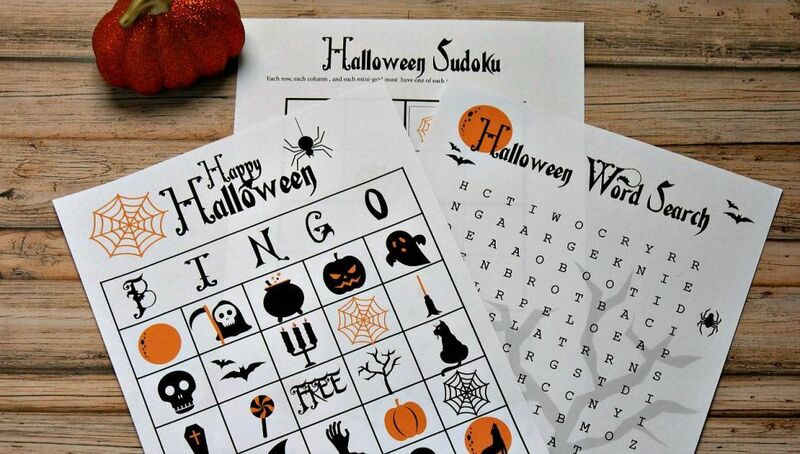 In addition to the bingo game, there's also a free printable Halloween word search and Sudoku. Besides this creepy pumpkin design, Makoodle also has some free Halloween bingo cards you can download in a spider web or skull design. There are two downloads which include a set of either 8 or 6 Halloween bingo cards. These free Halloween bingo cards from Arsty Fartsy Mama includes 6 different bingo cards along with matching Halloween bingo calling pieces. There are even game instructions included if it's been awhile since you've played bingo. There are eight different versions of this adorable Halloween bingo card that you can get for free over at Crazy Little Projects. There are also free calling cards to go along with the bingo game. Looks like fun! These fun Halloween bingo cards from Pretty Providence have colorful Halloween images that are friendly for all ages of kids with nothing too spooky. You can download these bingo cards in a family set of 4 or a classroom set of 30. Crayola has a set of 5 Halloween bingo cards hidden within the Halloween coloring pages that are meant to be printed out and then colored before playing the game. Additional cards can be printed and cut out to use as caller cards. With a few clicks, you can have these printed out and ready to go in no time. Alice & Lois have created these illustrated bingo cards that are perfect for Halloween with drawings of candy, owls, spiders, gravestones, and other creepy images. The free downloads include 6 bingo cards and an icon sheet. Studio DIY has designed this classy set of black and white Halloween bingo cards that would be a great fit for an adult or kids Halloween party. There are 10 different bingo cards in this same design available and you can print them on colored paper or cardstock to give them a whole new look. These Halloween bingo cards feature everyone's favorite Disney and Pixar villains that can even be playing outside of Halloween. This printable bingo set includes a PDF file with 8 bingo cards and calling cards. I love the vintage feel to these Halloween bingo cards from The Crafting Chicks. These printable Halloween bingo cards are available in orange, teal, green, and gray. There are also some adorable calling cards to match. The Halloween bingo card set that Attempting Aloha has created includes 10 unique bingo cards. These free Halloween bingo cards are super cute with images of bats, pumpkins, black cats, witches, and candy. You can print 8 Halloween bingo cards at Kid Scraps and they are in a great 5X5 size that would be perfect for older children. There are also printable directions and caller cards for this set of Halloween bingo cards. DLTK has a very cool bingo card generator that makes it easy to create your own custom Halloween bingo cards. Follow the directions on the website to make your own Halloween bingo cards using a 3X3, 4X4, or 5X5 card. You can even choose whether you want to use all pictures or to throw in some Halloween themed vocabulary words. Download these free Halloween bingo cards from Scouter Mom and you'll get a set of 10 picture bingo cards along with calling cards. This simpler version of Halloween bingo only requires children to get 3 in a row for a bingo. Free Halloween Bingo Cards by Prepared Not Scared! These are some very colorful and unique Halloween bingo cards that the kids and adults alike are sure to love. You can download the free Halloween bingo cards plus calling cards in either an 8x10 or 5x7 size. This link will take you directly to a PDF file that has 12 Halloween bingo cards that are ready to print out and be used in the classroom or at a Halloween party. There are also two blank Halloween bingo cards at the end that can be printed and turned into whatever you can imagine.